Today is the big reveal for the Blu Mudd Design Contest and boy, are you in for a treat! Mohiah Betterly, the creative genius behind Blu Mudd's beautiful ceramics, decided to run this challenge a little differently. 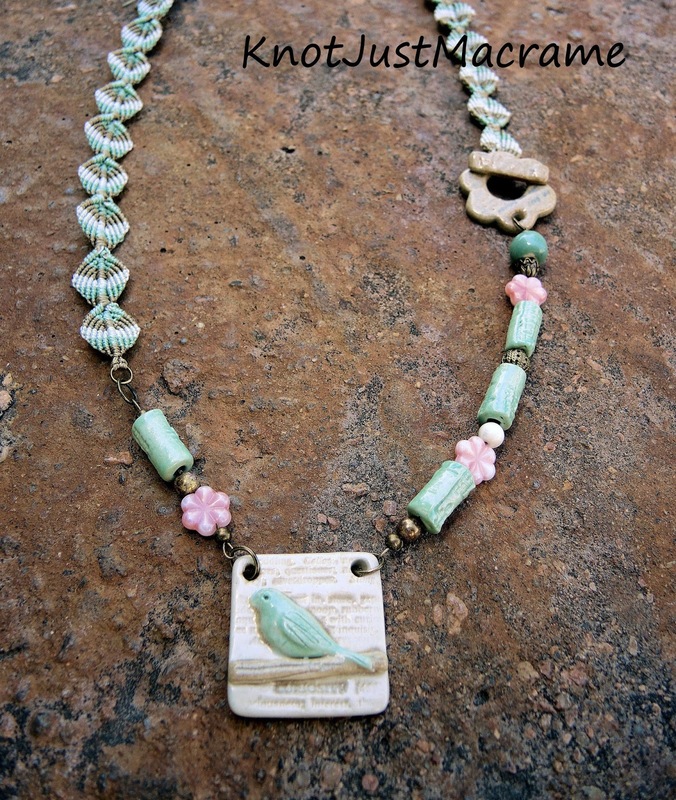 She made up 30 kits with the same ceramic components - a square pendant with a bird on a branch, a flower toggle clasp, and 4 cylinder beads - and put them out for designers. The rules were fairly simple and pretty much just required that all of the pieces be used. Alrighty, then!! Game ON. I pulled out some beads and cord 'cause that's how I roll. With 30 designers all working with the same pieces, the trick was going to be doing something different. I had an idea in my head of some sort of macrame pattern to mimic leafy vines, so I sat down to try to do that. Uh, huh. Easier said than done. You can read about some of my trials and tribulations here when you get a minute, but for now, I'll just show you the first design I did. This pattern was a better size for the beads and finally, I was onto something. 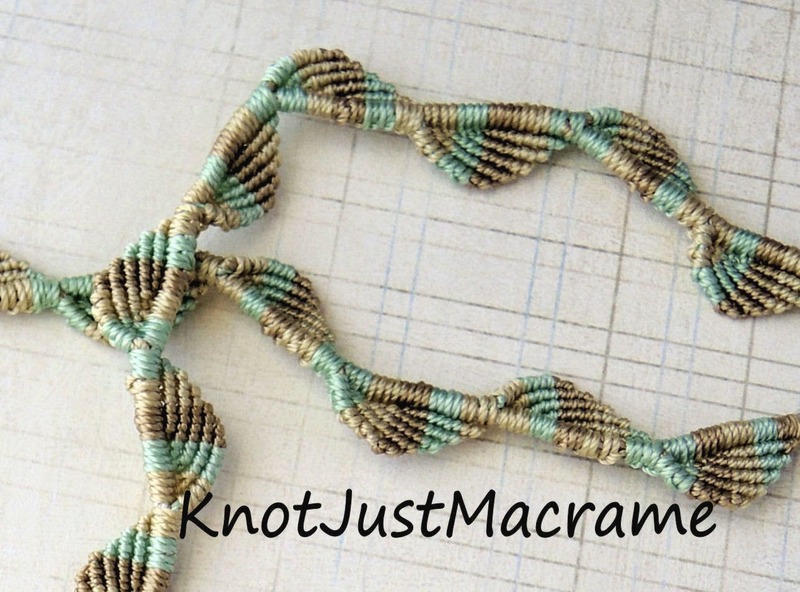 I wanted to make the macrame go up and around the neck and use the toggle clasp in the front in an asymmetric design, which meant I just needed to use the 4 cylinder beads somewhere. And I faltered. Really??! All that and I get stuck on the cylinder beads? Turns out that 4 is a hard number for me. I do 1 and I do 3, but I don't do 4. I tried using one in the necklace and using the other three in a bracelet. I actually made the bracelet using cord to tie it in a simple design and then using the same cord to finish off my necklace (sorry, I cut it apart without getting photos) and I hated it. You know that easy knotted style that's so popular? You'd think with all the knotting I do that would be a piece of cake for me, right? Wrong. And you know what trips me up? The ends. I'm a perfectionist and I keep wanting to tidy everything up and those knotted ends just drive me insane! They look so perfect when someone else does it, but I cannot do it! So.... After cutting all that apart, I decided to go back to one piece and use the four beads come hell or high water. The clock was ticking. I drug out my wire intending to do some wrapped loops and attach the components and I ran into another snag. My necklace was already fairly long and making wrapped loops and connecting all the pieces was going to add even more length. Good lord. And then it hit me: stringing! I did some simple stringing to connect the ceramic cylinders, Czech glass flowers and a few random brass beads to the macrame section and the focal and toggle. Done! With a whole day to spare :) The length and the soft colors made it a bugger to photograph, but I'm still really happy with it. And there you have it - The Saga of the Ceramics, The Vexation of the Vines. Now comes the fun part! Head on over to the Blu Mudd facebook page where Moriah has set up an album with all of the designs. Check out what everyone made using those same components and vote for your favorite (the rules for voting are there are the top of her album). She will tally up the votes on June 7th and one lucky designer will win a credit to her store to get more of her lovely ceramics!! I got a sneak peek at the pieces yesterday - you won't be disappointed!! Your necklace turned out great despite the trials and tribulations you faced:) You set off the ceramic components beautifully. Very unique design, it is beautiful. The first thing I think of is the beach and the waves flowing. The colors are so soft. Love this Sherri. You are the Queen of macrame for sure. Lovely pattern for a beautiful necklace.....! So cute!! I love the colors! Sherri I love how you stay true to your style but are able to incorporate so many different elements with it!! 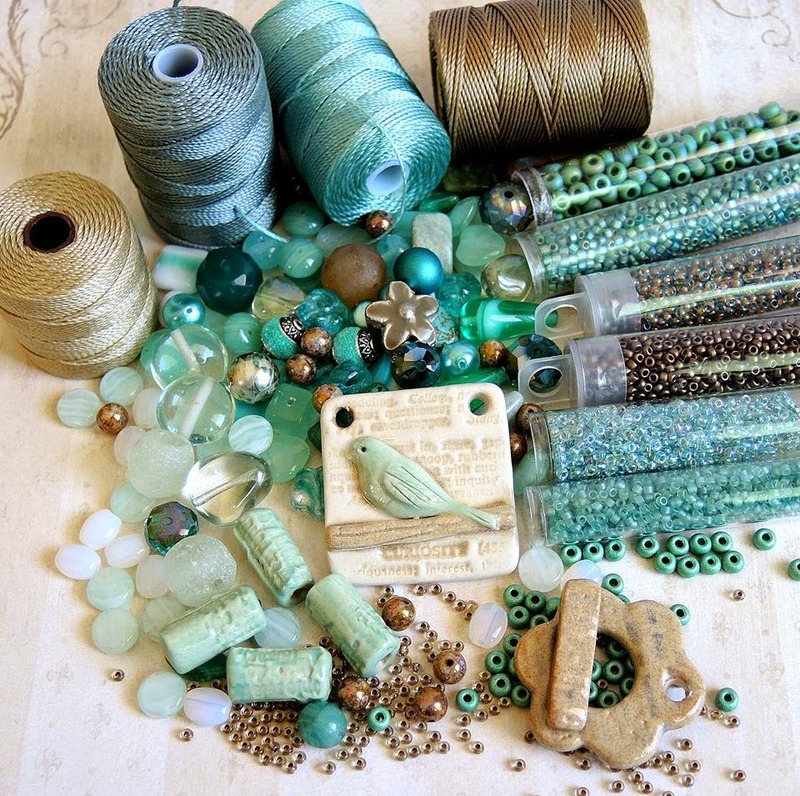 I love this necklace and a glimpse into your design process!